The year is only about a third over, but I feel like I’ve endured enough runner-ups for the rest of 2016 already. My Carolina Panthers lost the Super Bowl in February, then my UNC Tar Heels lost the championship game last month. Heck, even the Charlotte Hornets teased me into thinking we might win that first round series versus the Miami Heat before coming up short in the end. 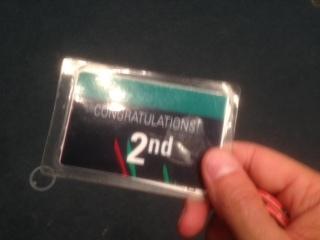 Now I have my own second-place finish to add to the list, after playing deep into the night in the media tournament here in Monaco at the European Poker Tour Grand Final. Prior to my own poker-playing fun came Day 2 of the Main Event, a relatively shorter day that went from noon to around 8:30 p.m. without a dinner break. Got a sandwich and a cup of tea after that, then headed over to the media tourney that started around 10 p.m.
I’m not playing a heck of a lot these days, so these media tournaments are kind of a treat. Like others on the EPT, this one was €20 to play. Unlike others, they made this one a “knockout” event with a €5 bounty on each player, too, making the entry €25. We got going on time, and were seated in the main tournament room along with the other side events still going on all around us. About 40 or so participated, I think, or perhaps a few more. Footballer legend Ronaldo (i.e., Ronaldo Nazário) played -- you can see him pictured at left -- as did Friend of Team PokerStars and Global Poker League player Felipe “Mojave” Ramos (against whom I played an interesting hand in the media tournament at EPT Dublin). I didn’t end up playing against either of them, but had a ton of fun nonetheless competing versus my media friends and colleagues. Enjoyed greatly hands during the first hour-plus when the blinds weren’t yet too big to prevent postflop shenanigans, giving me a chance to play position a lot and also occasionally pressure shorter stacks. Soon, though, that became harder to pull off as the levels were only 10 minutes long, forcing the all-ins all around fairly frequently. Got in on a five-euro last longer organized by Frank Op de Woerd that ended up being worth more than third-place prize money as so many participated. That became interesting once we got to the nine-handed final table when I had an above average stack and the only other two still in the last longer -- Victor (who writes for the PokerStarsLive French site) and Stephen (of the PS blog) -- came in short. While I started the final table well by adding chips in the first hand, those two went all in a couple of times against each other after with Stephen coming out the worse of it, then shortly after getting eliminated. Soon after that Victor and I decided to chop the last longer, guaranteeing each of us a profit on the night. Made it through the cash bubble (the top six finishers got paid), then with five left got short myself. A hand then arose in which Victor had raised all in and after posting the big blind I had only a couple of BBs left. Looked down at 5-2-offsuit, decided my range included any two cards, and called. Despite being up against two bigger cards I ended up making two pair by the turn, which beat the pair of jacks Victor made on the river, and a little after that chipped up enough to take the lead (winning a big one with pocket kings once along the way). Actually had something like half the chips with four left, though things got even again when we were down to three. Victor then finally went out in third, and one of the TV guys Farhan and myself were heads-up. I joked that if we were still playing at 5:30 a.m. they’d make us stop as had happened with Ole Schemion and Fabian Quoss the night before in the €50K Single-Day High Roller, although we knew it wasn’t going to last much longer given the relative depth of the stacks. I had a small advantage when we had our first all-in situation, with me calling his shove with K-10 and feeling pretty good about things when he tabled K-2. But a deuce appeared in the window, and suddenly I was down to four BBs and outchipped something like 6-to-1. I’d double once with 5-3 versus his J-6 after he flopped a six, then I hit runner-runner two pair (I was around 6% to win on that flop). But then Farhan got me with 5-4 versus my A-3 (see left), meaning every heads-up all-in was won by the player with the worst hand when the chips went in the middle. It was around 2 a.m. by then. Like in Barcelona earlier this EPT season (where I finished third in the media tournament), my only real disappointment was missing out on getting a winner’s photo, although the €275 I ended up taking away was a decent consolation prize. That total came from second-place prize money, chopping the last-longer, and the half-dozen or so bounties I collected. Just missed out again on being the first to win two of these media tournaments on the EPT (I think), after winning that one way back at EPT Kyiv many years ago. Grabbing some sleep now. The tournament most people want to read about is still going on today, of course, with just under 200 making it to today’s Main Event Day 3. Check in again at the PokerStars blog to see who wins the all-ins over there and continues to have a chance to make their final table on Friday. 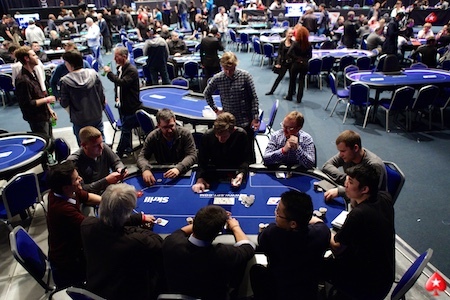 Photo (nine-handed final table): courtesy Jules Pochy/PokerStars blog.